Cliff Gustafson was the man for the Longhorns for three decades. If Roger Clemens has his way, one of the most successful baseball coaches in NCAA Division I history will be more deeply honoured. Clemens recently said that his former coach at the Texas Longhorns, Cliff Gustafson, should have his name added to UT’s baseball stadium. The Rocket may be a suspected cheater and liar, but he has a point here. 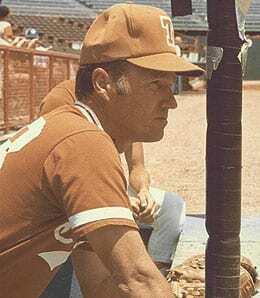 Gustafson ran Texas’ baseball program for 29 years, winning 22 Southwest Conference titles and guiding his team to the College World Series 17 times — winning twice (1975 and 1983). He was the all-time winningest coach in college baseball history until his Longhorn successor Augie Garrido broke his record in 2005. If UT is legitimately considering renaming the stadium, now’s the time to do it, while the 82-year-old Gustafson is still alive to cherish the honour. Now the question is: will Clemens still be alive when he gets honoured by the Hall of Fame? We slotted Mike Napoli just inside the top 35 of our First Base Rankings heading into the season. So far, he’s been one of the most pleasant surprises of April, playing at a top five level and assuaging any fears Boston had about his hip when his signing dragged on for months. After a grand salami and five RBI Monday, Napoli now has eight RBI in the last three games and an AL-leading 25 through 19 games. His days of offering a sprinkling of steals are over, but how much is this dude loving mashing at Fenway? A slash line of .306/.390/.611 at home should answer that question. Of course, this isn’t new. In 19 career games at Fenway before this season, he hit .306 with seven jacks and 17 RBI. Kudos to those of you that risked Napoli’s hip woes and scooped him up in your draft. And how about some kudos to the BoSox for adding him? Napoli’s early-season prowess is a big reason Boston has opened up a two-game lead atop the AL East. A.J. Griffin’s superb start to the season has made him a waiver wire darling of late, but that roll will skid to halt after his ugly outing Monday. The A’s young righty was burned by Boston for a career-worst nine runs (seven earned) in four-plus innings as his ERA literally doubled from 2.25 to 4.50. Oops. Control — a rare issue for him in his previous start — was not a problem for Griffin Monday, but he was simply shelled and served up a pair of gopher balls in the onslaught. Write this off as simply a bad start against a team that was probably quite pissed after getting swept in a doubleheader by the Royals and was after blood. Griffin emerged with the fifth starter job over Dan Straily for a reason, and even as Straily dominates at Triple-A, Griffin’s solid start has bought him plenty of rope. If any A’s starter is in danger, it’s Jarrod Parker, although it looks like he turned the corner with a quality outing Saturday. Crave more in-depth Fantasy analysis? Then join us every Thursday at 9 p.m. EST for RotoRob’s Fantasy Baseball Weekly Podcast on Blogtalkradio. Tim McLeod and I will entertain and edify you for a half hour or more each week. We’re off next week because of the NBA Playoffs, but will return on May 2. Tune in here. This entry was posted on Tuesday, April 23rd, 2013 at 3:57 pm	and is filed under BASEBALL, Fantasy Notes, RotoRob. You can follow any responses to this entry through the RSS 2.0 feed. Both comments and pings are currently closed.